If anyone finds and posts a Boer War gravestone, could I ask if it would be possible to let me know? I'm collating a list of stones bearing the names of men killed in the Boer War and this would be an awful lot quicker than trying to keep up with all the threads in all the areas! I've got two or three from the Glasgow Necropolis. I'll see if I can find them. There are two War Memorials in the Isle of Lewis which list casualties from the Boer War. These are the ones at Kinloch and Borve. Thank you adb41, names duly noted. If on your travels you ever come across any graves for men mentioned as being killed in the Boer Wars, I'd be much obliged if you could either transcribe the (full) MI or take a wee photo or two. 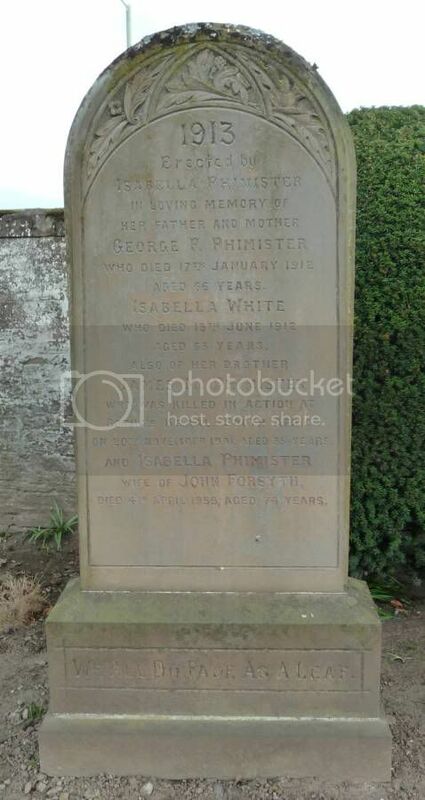 I've posted a boer war family grave from the former Logie churchyard near Montrose. I wonder if he's the D Milne listed on the Argyll's memorial at Stirling? There's no D Milne on either the Black Watch or Seaforth memorials. Having posted a request on Boer Wars forum for pics or info on Boer War Nurses with only one response I would be most grateful for any info if you come across any Scots Lasses graves or memorials from the 2nd Boer War. Indeed, if there are any, from the 1st Boer War also. There's a David E. Milne from Mains of Logie listed on the Angus Muster Roll. There's one or more at the end of the Laurencekirk thread now. At Arbroath's Western Cemetery is this one, which I'm re-photographing in order to add the many family gravestones there with war casualties mentioned on them.